Letters to the Editor – What Goes on Behind the Scene? Both Mimi and Jim are writing this post, Basically, Jim is the active voice (me) and I will indicate things Mimi has said. Mimi’s a double genius! She’s a genius at designing and making dolls, and she’s a genius at teaching others to learn techniques they can apply to their own doll creations. Mimi’s an Artist. Mimi is also the originator of doll class conventions. Back in the 1990’s Mimi wanted to study with Lisa Lichtenfels (NIADA). Lisa was willing to teach a class to make the travel and time away from her work palatable, and Mimi was too broke to pay Liza’s fee and her own travel expenses, and so the first Master Artist Class at Dollmaker’s University took place in Mimi’s basement. Mimi found nine other dollmakers who wanted to take a class with Lisa. Mimi extended the idea to some of the NIADA (National Institute of American Doll Artists) artists trying to find a way to pay for their trip to the NIADA Conventions and helped set up the teaching programs at NIADA. 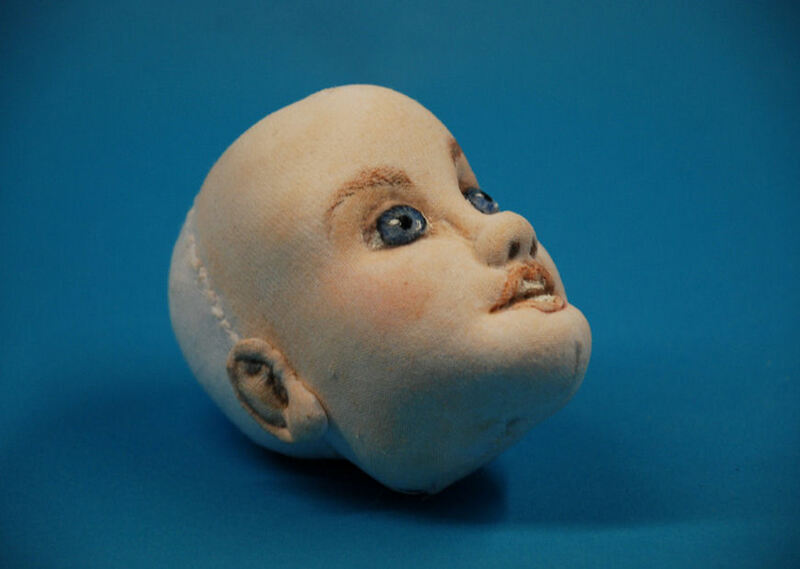 She took the same idea to magazine editors, and store owners, and others, and soon there were dollmaking conventions open to the general public and advertised in major crafts magazines where you could go to take classes from other well-known doll artists. Jim’s a computer nerd and a writer, and an illustrator, and a photographer, and anything else technical that you could think of. Jim’s currently available. Project Managers should visit JimWiner.Com to find out how to get good technology writing to the people who need it, when they need it, and how they need it. Cassi’s the third person. Her job is to talk electronically to dollmakers and quilters in places where we don’t already know about them, and where they don’t know about us. We used to have 50,000 cloth doll makers a few years ago Maybe we still do, but most of them are not on the Internet? What will happen if we work together as a family? Can we get more people interested in the hobby of cloth dollmaking? Mimi is an Artist. She has specific ways of working. She is not a Television Actress. She gets involved in what she’s doing and gets off her mark and you can’t see her for a while. I tried actually operating the camera when we started. She moves too fast! I can’t follow her fast with a close-up – she out runs the camera, and worse, it tries to autofocus because she’s moving. Shooting over her shoulder with a video monitor in front of her, we had two choices: 1) use a wide field of view which would let her move around more, but what she was doing would be very hard to see because it was too far away and small, 2) use a narrow field of view (that means we have to lock the autofocus because she gets her head in front of the camera) and she gets out of her spot where you can’t see her occasionally because she forget’s to look at the monitor. The compromise we got worked fairly well. It prevented Mimi from moving around too much and we got a pretty good DVD. The sound could have used some improvement, but it’s the first time I actually edited the sound as well as the picture and the story. Q: I want the doll face to be of the same fabric as the rest of the doll. MIMI: It takes a knit or quite stretchy fabric to stitch a face with lots of detail. However, until last year, I never used an overlay. My dolls were mostly all muslin. If you put the face pattern on the bias of the woven fabric you will have a bit more stretch. You will be able to do a closed mouth but not an open one – it takes a great deal of stretch to create an open mouth. Most folks do not like a seam down the front of the face, but that is not why I began using the overlay. The knit or spandex overlay allows me to get much more detail in the face. realistic nose. If the seam allowance is kept narrow , evenly trimmed and straight the seam will not be noticeable. To make the seam “disappear” be sure the seam allowance is even, notched and snipped so it follows the curve of the head. if the seam allowance becomes twisted it will cause a bump, usually on the forehead or at the tip of the nose and that is the first thing one sees when viewing the doll. My patterns of Jazz and Victoria Rose are made from muslin and have faces of muslin, They are “stump” heads, which are part of the torso, the face is added after the torso is stuffed but the face is also muslin. needle modeling instructions are included. Q: I like movable joints, including the neck. 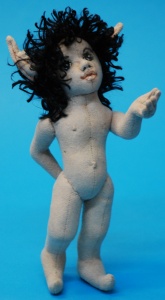 Q: I want the naked bald doll to be as beautiful as the finished doll with clothes and hair. So Do I, That’s why I like to do dancers with as little clothing as possible. After working for many years to perfect my realistic human bodies I hate to cover them up. 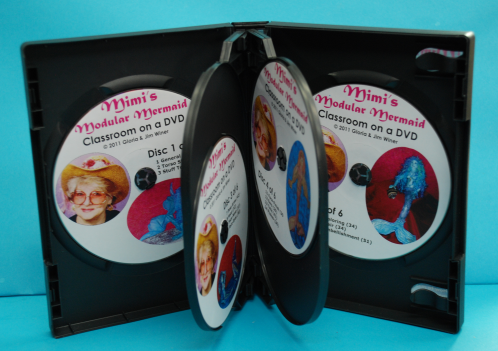 You can have a bald head, but you have to use the directions on the DVD for covering the back of the head. The needle modeling of the face usually distorts the back and top of the head. I simply cut an oval of knit or woven fabric (cut on the bias) and stitch it to the back of the head. Before I finish stitching the covering closed I stuff a bit of fiberfil inside to re-shape the back of the head and the top if it needs it. If you look a the photos of the heads on my DVD cover you will see that my hairless head looks just fine. It does not have to be lumpy and ugly. That’s why I shape the overlay pattern to fit the head not just use a circle or oval of fabric and glue the overage to the back of the head as some do. face, a child face, a baby face and different emotions. MIMI: A baby face has all the features in the lower half of the face, the lower the features the younger the face. A male face has a square jaw, slightly longer chin, a wider mouth and a larger and often longer nose. Eventually I may do a DVD for where to put the dots for masculine and ethnic faces as well as children. The technique is exactly the same, the difference is where you put the dots and how you design the skull shape. There are several sections in the DVD that show how to get emotion by moving the brows, cheeks, and corners of the mouth. 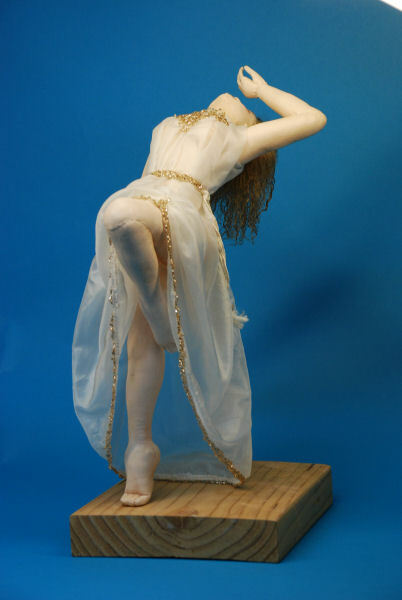 The High Priestess is a beautiful, young female dancing figure. She is posed on one leg with the other knee raised high. One arm is over her head and the head is bent backward. She wears only a diaphanous silk chiffon gown. Her hair hangs freely down her arched back. 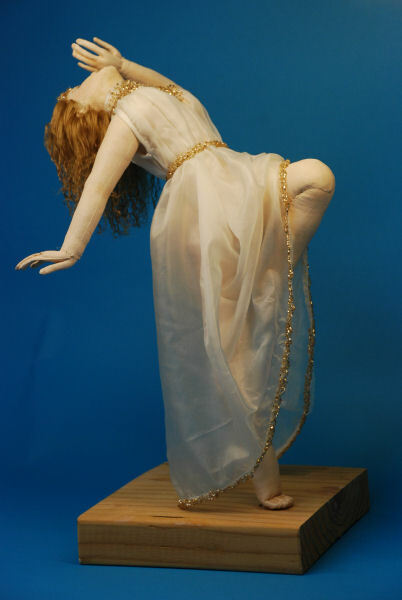 High Priestess Drawing Down the Moon is a 19 inch fabric sculpture. This three-day intense class is designed for the advanced skilled doll maker. However intermediate doll makers would qualify if you have very good hand sewing skills. 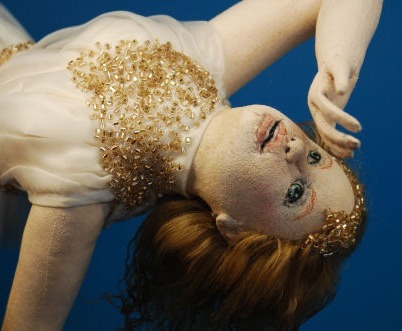 As you can imagine creating a doll of with such natural beauty takes time and skill. This is a class you will never forget, and you will acquire skills of concentrated precision. You will need to do your homework before coming to class. The homework is basic but it must be done in order not to be an interruption to the other students in the class. Home work will start with Gloria mailing you the pattern, sewing instructions, fabric and dream-seamer tool. She will send this to each student 4 to 6 weeks prior to class. The entire doll skin and head must be stitched prior to class. Day One: In class you will wrap a wire armature; insert it into the sewn torso and stuff firmly and smoothly around the armature. The torso will be closed and needle modeled to form the musculature of a young female dancer. Legs will be trimmed, treated, turned, armature inserted and stuffed. Day Two: Gloria will instruct you how to stuff the sewn skull and affix the cotton-spandex overlay. The nose, eye-sockets, dimensional eyes, jaw and open mouth will be modeled and stitched. Ears will be stuffed, needle modeled, stitched and affixed to the head Students are encouraged to pre-stitch two or more heads. Day Three: The head will be pinned and stitched to the torso. Hands will be constructed of wire woven and wrapped with floral tape and inserted into sewn turned gloves. Arms will be armatured and stuffed, assembled and attached to the torso. Legs will be pinned in place using a master drawing as a pattern for accuracy and balance. Time permitting, costuming and wigging as well as coloring face and hands and painting boots will be discussed and demonstrated. This class is all about learning new techniques, not completing a doll. Complete instructions will be handed out in class which will help to complete the figure at home. Some advanced students and those who work after class may just finish the piece in three days. Saturday, August 7, Cassi and I attended Day with Dolls in a really nice church in Bronxville, New York. It was less than a two-hour drive from home early on Saturday morning. 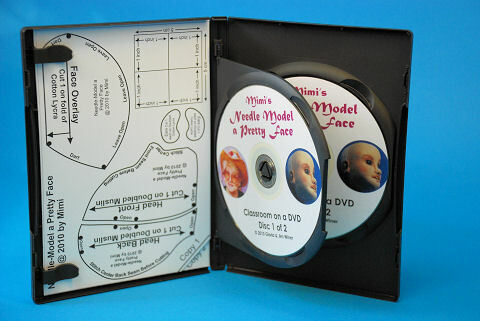 I was demonstrating how I needle model a face, and I just happened to have my new DVD with me. 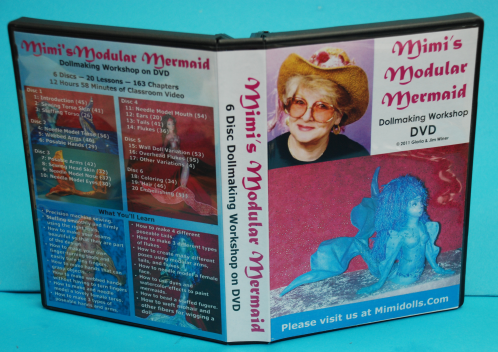 You can get a copy of the DVD from either DollmakersJourney.com or from Mimidolls.com — BUT — it’s on sale at DollmakersJourney.com from now until the end of August for 20% off. Get it before the end of August from DollmakersJourney.com and save up to $8. This pattern can be reduced or enlarged for use on any cloth character doll. 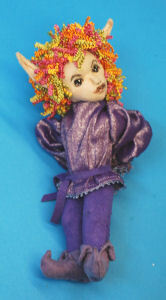 For the past few months Gloria has been working on a series of 7” elves. They have long Elvin ears, little round tummies, short legs and arms and separate fingers, with a new way of wiring them. Their faces are adult faces but their bodies look child-like. The three-day workshop will be held at the Danbury Plaza Hotel. The cost for all three days is $200.00. Accommodations at the Danbury Plaza Hotel, which includes a hot American Breakfast are $109 plus taxes per night – single or double occupancy – so bring a creative friend. The Danbury Plaza Hotel is 10 minutes from Metro North – Brewster Station. Shuttles are available to the Station. It is a 50 minute trip from White Plains to Brewster. You can choose to enjoy wonderful lunches with your fellow artists or bring a packed lunch. The three-day lunch ticket is $40.00. 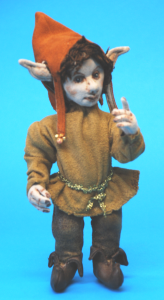 For the past few months I have been working on a series of 7” elves. They have long Elvin ears, little round tummies, short legs and arms and separate fingers, with a new way of wiring them. Their faces are adult faces but their bodies look child-like. They look cute naked but I am busy dressing a litter of 9 of them. As I complete them I will show their photos here.